All 2006 Summer Summaries are dedicated to Kurt Keuper, Ursula's father. Hi Dad! This week's summary is also dedicated to Norman Scheidt. One of the problems writing about this week is we don't remember it. So it's really true they what say about The Sixties: "If you remember it, you weren't really there." We don't remember this week but the photos we took proved we were "there." I guess it's fair to begin by admitting to a big mistake. That mistake happened on the evening of Friday, August 18th. We only knew about our big mistake after the fact--the proverbial retroactive mistake, the second-worst kind of mistake of all (the worst mistake being the one you never find out you made). We knew that the earliest day that mamma honu 5690 would make her seventh nest was the same evening that her second was being excavated. Excavation over, we continued a conversation in the parking lot to well past 8:30. Unknown to us, 5690 had shown herself early. She was seen at the waterline at around 8:00 pm while we were still deep in talking story by our car! We did return to the beach for our seventh nest vigil but saw no sign of tracks or the turtle and left by about 11 pm. As we reported last week, what greeted us the next morning were tracks all over the beach. Oops! As we left you last week, 5690 was a no-show on Saturday night. We were preparing for a Sunday night watch. We stood watch until 2 am, then called it a night simply because we were so brain-dead tired that we just yearned for some place to lie down in with no sand in it. Monday morning about 7:30, we received a call from Skippy Hau. He related the startling news that 5690 was up on the beach "right now," so we leaped into Sunday night's sandy clothes and drove to the park. It was true. There was 5690 in broad daylight. We'd never seen her like that before. Broad daylight and it meant there was still a chance to drop a temperature logger in her nest--if she actually made a nest. There were surprisingly few observers considering the time and the normal activity on that beach, perhaps half a dozen people at most. The family that had called in the sighting had also warned people not to disturb her. We tried to determine when she'd crawled up, but no one present had actually seen her emerge. The earliest that anyone reported seeing her was 7 am. It was now nearly 8. If she'd been digging only an hour, there was no nest. While we were still asking questions to try to determine what stage she might be at, 5690 decided it was time to leave. (Ursula took this personally.) Almost before we realized it, she was headed down the beach at a much faster clip than her usual post-nesting pace. Moments later, she was gone. 5690 makes a hasty exit. Now we were faced with the same puzzle we had been left with on Saturday morning. Nest or no nest? Clearly the Friday night effort was not a nest, else she would not have been back. This dig, however, was more extensive. It was in the naupaka (a Hawaiian shrub that grows on beaches) just above the highwater line and right next to a large outrigger canoe. Her options for an egg chamber were therefore limited. Based on her tracks on the beach and the tide at the time, it seemed unlikely that she'd made a nest--at least, to Peter. 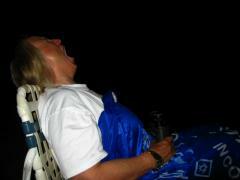 Ursula disagreed. She thought there just could be eggs there. One way to test the theory would be to watch Monday night. If she came back, no nest. If not, maybe a nest. 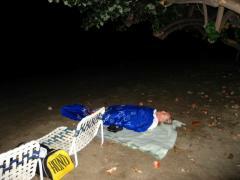 So we prepared for an entire night on the beach, this time to well past dawn. After so many other late-late nights on the beach, for the first time in her life Ursula offered up, "We're too old for this." Peter's response was swift. "If you think you're too old, you will get old." Ursula shut up after that. At about 3 am, a pretty girl approached Ursula and asked, "Do you know Kojack?" Ursula responded with, "Sorry, I don't know anyone," and received a shy, friendly wave in return. Beach People respect each other's privacy. Dawn came and went and morning colour showed on Lahaina and Lanai. 6 am and Ursula walked the beach for tracks again. That's when she saw The Others. Beach People, still asleep. 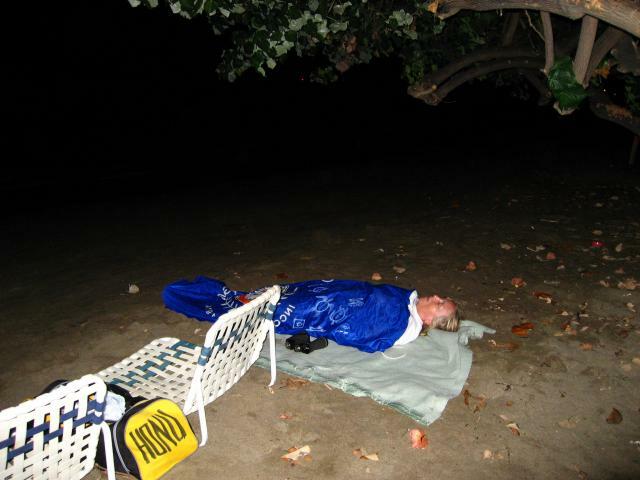 One man slept in a "bed" of naupaka. No blanket to cushion him. Just lying there, arms crossed and a T-shirt covering his face. Another man further down the beach was already awake. He smiled and said, "Good morning," and Ursula said, "Good morning!" right back and really meant it. Anybody who calls the beach Home and rises with such cheery disposition is a better person than her. Since her experiences, she has thought about Beach People a lot. Like how well they really actually sleep,or whether their rest is frequently interrupted during the night by "activity," and how they have no share in Maui's prosperity. We stayed until 7 am, saw no sign of 5690, and then went home and crashed into real beds. We don't remember the Day, and the sleep wasn't enough to restore our energy. Yet by evening, we were returned for another night watch for 5690. At 12:30 though, we called it quits. There Comes a Point. 5690 hasn't returned since. Did she go elsewhere, where no one saw her, to drop her seventh clutch? Despite the evidence against it, did she actually complete a nest on Monday morning? We don't know. 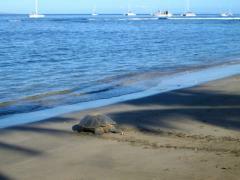 Perhaps in a couple of months, little honu will crawl out of the naupaka and scurry down the beach. Peter doesn't think so, but Ursula thinks it could happen. Given the disasters of 5690's first two nests, and the fact that nest 3 is overdue with no signs of hatchlings, we can only hope that it does happen. We slept and slept and rested and then rested some more. Then when we were ready to dive, we couldn't. Swells moved in. We really only had one dive this week and the visibility--wasn't. Still. It was good to be with the turtles again. Dare we say it again? My, there are a lot of turtles! No sooner did we descend than we saw the hawksbill. She ignored us, letting us follow her foraging foray. In all that time we didn't see the hawksbill find a single place she felt was worthy of actual digging. This 'ea has to work extremely hard and long for its food. Only once did she manage to settle in and begin prospecting. Ursula was photographing. Then to her left, Ursula saw a large honu approach. Perhaps this was The Chance. The Chance to photograph a honu swim over an 'ea and get a photo first. The so-far-elusive decent photo of honu and 'ea together in the same frame. 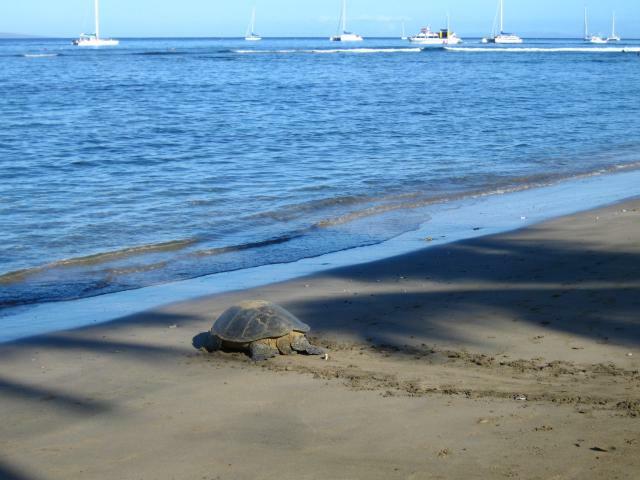 As the honu swooped closer, Ursula recognized the male and realized it would skim right over the 'ea. Ursula actually had to back off to ensure that both would get in the picture! The honu landed atop the 'ea and snapped a judicious snap on the 'ea's beak. Ursula was astounded! 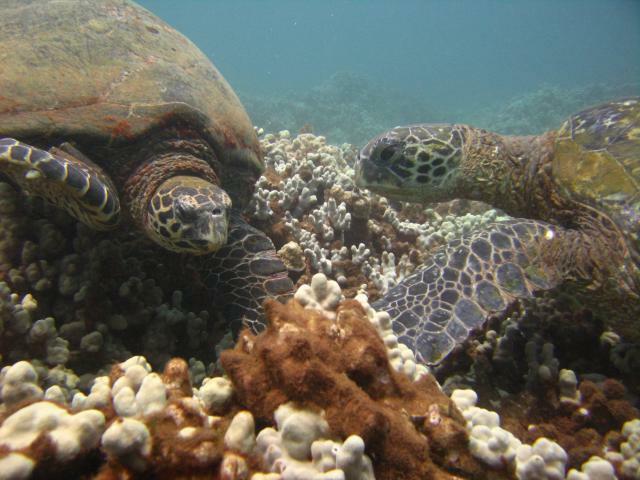 Of the many honu and 'ea interactions we've seen, the honu had always been on the receiving end. Then came the stare down. Would 'ea unleash her beak in retaliation? 'Ea and honu get together, sort of. 'ea backs away. We love this photo for the resolute, crabby, almost-fierce look in the male honu's eyes. 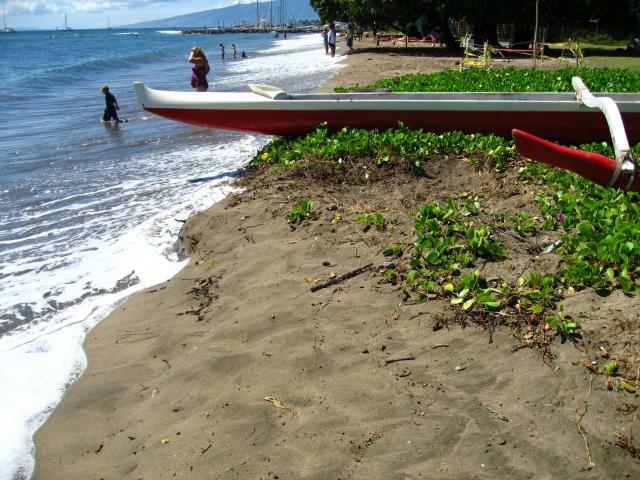 This might have been an unprovoked attack by the male honu. Then again, we're not sure. Did the 'ea do something to this honu prior to us showing up? Was the honu-snap to 'ea's beak payback time? Still going. One chapter unfinished. Will be to the publisher on time. We attended the Wedding. It was the most amazing perfect Wedding we've ever seen. 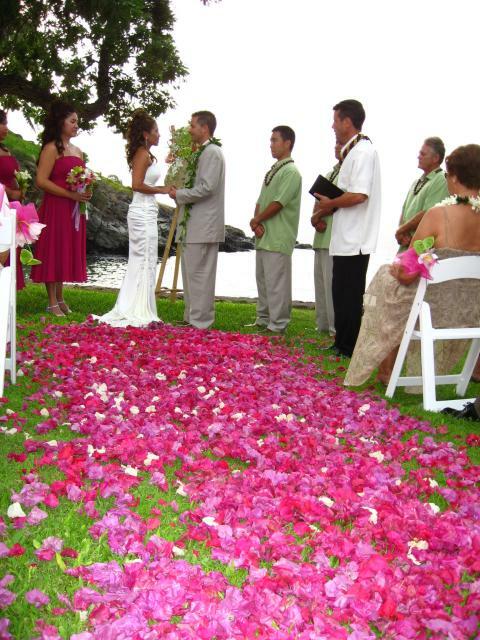 Notice how we keep writing Wedding with a capital W.
It was the Wedding of Francine Narito and Timothy West and it happened on a perfect Hawaiian afternoon, followed softly by a perfect Hawaiian sunset and led into a perfect Hawaiian night. Francine and Tim tying the knot in their Dream Wedding. Ursula marvelled at how even the wind cooperated this perfect evening. It didn't show up. There was just enough breeze to keep the wedding party cool and keep hairdos and orchids and fine dresses in perfect place. It was so perfect that Peter didn't even tip over the perfect table we were at when he stepped right down on the perfect white tablecloth that went all the way to a perfectly manicured lawn. The Wedding was perfect for another reason. 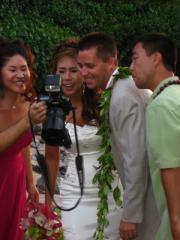 Aside from seeing Tim and Francine surrounded by their Family and Friends, both Bride and Groom were ...beautiful. What a Beautiful Couple! Francine and Tim, the Perfect Couple. Out of Everything Saturday Night, it was the Happiness we saw in both Francine and Tim that left us on such a spiritual high. They're off on a Honeymoon. May they grow happier, more in love and more appreciative of each other with each new day. We told you that the Wedding was perfect right down to the choice of who would sit together at what table. Since 2003, we've admired a turtle memorial tucked quietly under a tree atop a lookout over our Kuamo'o dive site. 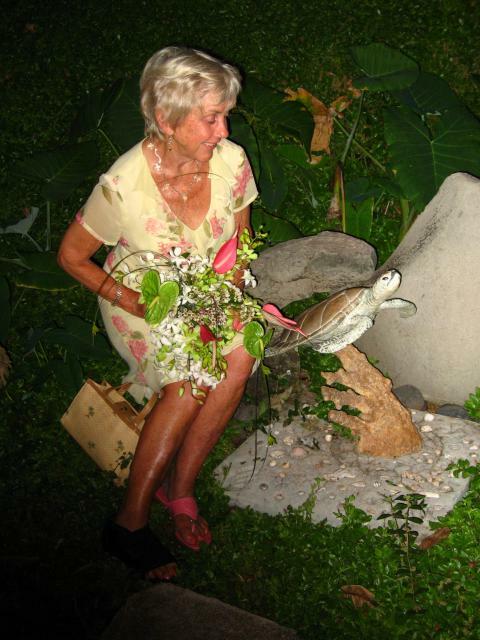 We'd heard the story about a woman who'd created the memorial for her late husband who so dearly loved to watch the turtles swimming there. Tim knew of our desire to meet the woman who had created The Turtle. Saturday Night at the Wedding, we met Mrs. Mary Lee Scheidt--yes, the woman who created the Tribute to a Lost Love. Mrs. Scheidt told us the whole story about the love of her life, Norman. We both felt such an immediate connection to this wonderful, loving woman. There were several times when Ursula felt a Profound Absence. She could only imagine what Mrs. Scheidt felt during this Perfect Wedding. Listening to Mrs. Scheidt talk about her Norman, Ursula looked up to the stars and wondered if he was looking down and watching--and if so, what Norman might be thinking. Our table was a table for eight. We'd all spent considerable time wondering whether the guest in the empty chair would show up, or whether he cancelled. Mrs. Scheidt even speculated on the name written on the card assigned to the empty chair. We all agreed it that the beautiful calligraphy said "Tim." "Tim," said Mrs. Scheidt. "There must be another Tim. I guess he couldn't make it." We gave "Tim" or "Tim's" card no thought after that. Mrs. Scheidt even slipped into "Tim's" chair so she could sit closer to us. It's Tuesday, August 28th as we finish this Turtle Trax update. Three days late. It has only occurred to Ursula as she writes now just how perfect this Perfect Wedding was. The card with "Tim" written on it. The empty chair. It wasn't for Tim. It was for Norman. As we said. The Perfect Wedding--and we are so grateful to Tim West. Mary Lee, widow of Norman who loved the honu.